The Foundation for continental law is responsible for the publication of the index of legal certainty (ILC), which evaluates the forms of security to all economic players. After proposing a definition of legal certainty based on three essential elements: an accessible law (contained in a compendium published, comprehensive and validated), a predictable law (through the hierarchy of norms and predefined skills of the legislator and the judge) and finally a law reasonably stable in time and followed a methodology for comparing the systems of 13 countries of four continents , in six areas of law (contracts, liability, corporate law, labour law, real estate law and settlement of disputes), the results indicate that “continental law” taken as a whole, countries provide a system of law relatively ‘safe ‘. The Foundation for continental law now wants to extend its work in order to integrate 04 new areas of law: law of public contracts, environmental law, intellectual property law, insolvency (collateral). And to add at least 05 new countries: South Africa, Spain, India, Nigeria and Russia. 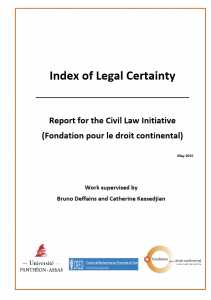 The Foundation pour le Droit Continental (the civil law initiative) is pleased to inform you that its executive board from the 9th of April 2015 validated the Index of Legal Certainty prepared by the team conducted by the professors Bruno DEFFAINS and Catherine KESSEDJIAN and with the coordination of Mr Jean-Louis DEWOST, former Director-General of the Legal Service at the European Commission and member of the Scientific Council of the Foundation pour le droit continental. Navigate to the foreword from the president of the Foundation pour le droit continental. This report is the result of 18 months’ work intended to lay the basis of an empirical evaluation of legal certainty in a context of international comparisons. The work was performed by a multi-disciplinary team of legal specialists and economists. In permanent collaboration with the monitoring committee of the Foundation as well its various bodies, and a network of legal professionals, the team began by establishing a specific methodology before drawing up questionnaires to be distributed in the representative countries selected. Once the information had been collected from professionals who are recognised specialists in the sectors of law concerned by the particular situations, statistical processing yielded the results presented in this report. The team would like to emphasise that this work, which is aimed at measuring legal certainty, is a first stage intended to encourage debate in order to extend the discussion to more legal sectors and countries. From a conceptual point of view, the report is based on the principle that reasonable legal certainty is not synonymous with immobility or equivalent to the absence of any legislative or regulatory constraints, even minimum constraints. On the other hand, it assumes the accessibility of the applicable law, its predictability due to the hierarchy of norms and predefined competencies of lawmakers and judges and reasonable stability over time and, lastly, a certain balance between economic interests and the parties concerned. This report has been presented at a Press Conference to the Ministry for Foreign Affairs on the 7th July 2015.